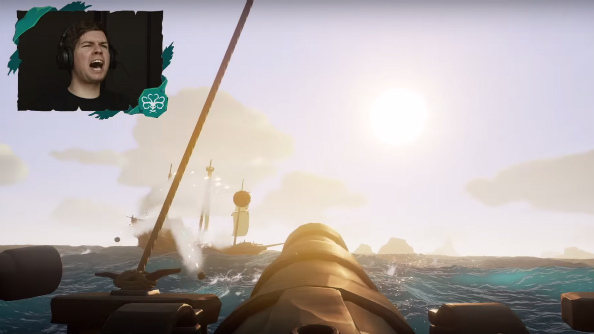 Calling it their biggest game yet, Rare have just revealed gameplay footage for their open-world, pirate themed multiplayer game, Sea of Thieves. The glut of footage came with a gameplay trailer – featured below – that showed off such piratical pastimes as getting drunk with your mates, blowing other people’s boats to bits and getting shipwrecked. We apologise for not warning you about all the screamy, shouty, YouTube-like people demoing the game. Regardless, Sea of Thieves looks impressive from what they’ve shown in the trailer – getting drunk with your friends, engaging in naval battles with a skeleton crew, getting shipwrecked. It’s all wrapped up in a bright and cartoony art style, and it’s got some fine looking water too.